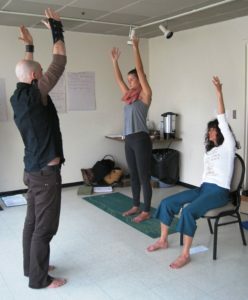 About a month ago, I took a weekend course on teaching trauma-informed yoga. 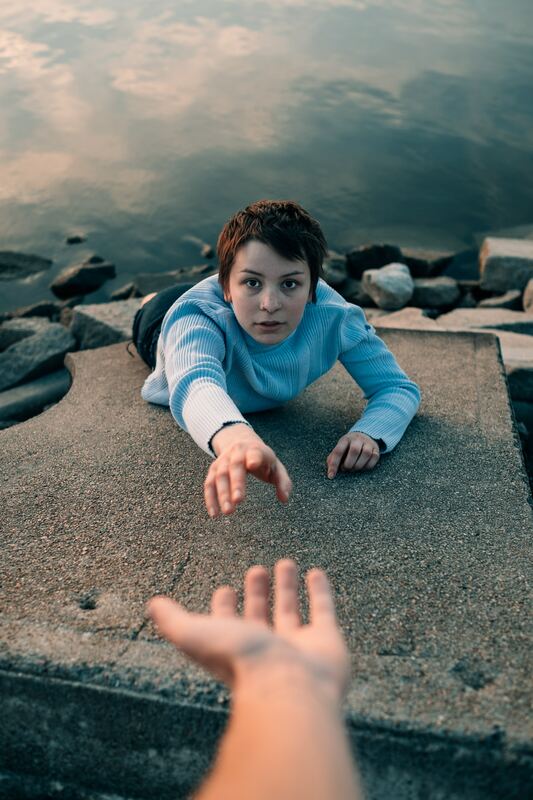 Trauma-informed means the instruction style is modified to better serve people who have been physically or mentally abused, or sexually assaulted. After completion, you can apply to volunteer at a transition house for women and children fleeing domestic violence, at an addiction recovery centre, or in a prison – anywhere in BC that Yoga Outreach has established a program. Plus, I’m hoping I can apply the training to classes I teach at my local Neighbourhood House. None of my students have disclosed having post-traumatic stress disorder (PTSD), but since many are recent immigrants and parents with lower incomes, I’m betting a bit of trauma sensitivity wouldn’t hurt.  Also, I should mention that I’m Yoga Outreach’s new marketing and communications coordinator (whoo hoo!). Let me say that my three biggest concerns about this training were completely addressed. Every change we were asked to make to our regular teaching style was backed up by scientific evidence and the experience of the most preeminent researchers in the field of trauma. “Invitational language” is the opposite of annoying. The effect on my own skeptical attitude was astonishing. Volunteers receive a ton of mentorship and other supports, because the program is working! Staff see results and just want to keep them coming. Read on for more about each of the points above. To get to the training, I have to walk through the infamous Downtown Eastside in Vancouver. The rain is pouring so hard my pants are soaked. Even so, there’s still a crowd socializing and hawking goods at the Main and Hastings corner. From my pre-class homework I know that a huge proportion of residents and street people in this neighbourhood are traumatized and using substances to cope. Some left abusive homes. Some have untreated mental illness. Some suffered losses as adults. And this lifestyle makes them vulnerable to even more physical and sexual violence. Clearly, most don’t have access to a yoga class or any other sort of trauma therapy. These are the people Yoga Outreach is looking to help. I feel a bit self-conscious, wending my way through, trying to look non-judgemental. When I arrive at the large common room at The View, a social housing complex, about 15 people are seated in a circle, one young man and 14 women from early 20s to late 50s, all wearing leggings, wooly sweaters or shawls. 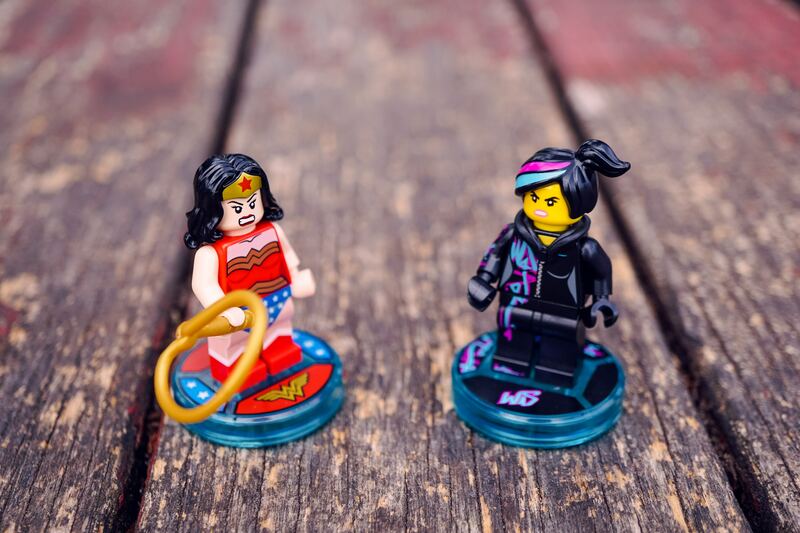 Some have cool tattoos, piercings or rainbow-coloured hair; others look more office-y. Only a few are full-time yoga teachers. The rest teach occasionally, or have just graduated from yoga teacher training. Our trainer, Nicole Marcia, begins by laying out ground rules for participating and introducing us to our hefty coil-bound textbooks. She’s honest with us about her own experiences with trauma and the unconventional path that led her to value yoga as a therapy. The fact that she doesn’t have a neat and tidy story makes me trust all the other advice she gives us. She asks us to hand in our homework. We are reminded that until our homework is completed, we won’t receive our certificate showing 18 hours of training. 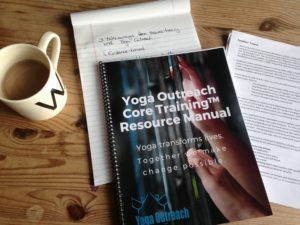 The Yoga Outreach Core Training™ manual combines practical exercises with a summary of scientific thought on yoga’s effects on trauma symptoms. The pre-training homework was surprisingly difficult, which makes me really happy. I hate when I lay out money and time and end up with hot dog water, i.e. expensive healing nonsense. This is the real deal though. Clearly, Yoga Outreach’s idea of “trauma-informed yoga” is evidence-based. Luckily, Nicole has been working in the trauma field for over a decade, and with Yoga Outreach since 2008. She completed 300 hours of training in Trauma Center Trauma Sensitive Yoga in 2017, and has a Master’s degree in Yoga Therapy – plus many more certifications than I can list in one blog post. Essentially, she’s able to translate all the science and academics into information we can use to plan our yoga classes. For example, she explains how a student might behave if they were having a flashback. She demonstrates how she approaches a student in this state (from the side in full view, not looming over the mat!). Drawing attention to sounds, sights, smells may help to bring the person back to the present moment, she explains. We talk about typical manifestations of dysregulation. We ponder the line between yoga instruction and psychotherapy. Everyone has a lot of questions. Discussions get pretty deep. Trauma-informed yoga invites students to choose how they will participate. My biggest takeaway from the whole weekend is how empowering this kind of instruction actually feels. I’m stunned. Reading about it made me expect wishy-washy and repetitive – not a tool I thought would work well with people trying yoga for the first time. But in reality, it’s so freeing. It’s so refreshing that I realize that when I’m a student in a regular class, part of my mind is rolling its eyes or worrying that the teacher will call me out for coming out of a pose too soon. Now the pressure is off. Who cares if I sit for Savasana? So what if I’d rather twist than fold forward? It’s all up to me. Of course, it’s not just about me. Offering choice in a movement-based class is a big deal for people coping with trauma, Nicole explains. At some point, the student lost their power to another person or incident. Having an authority figure (the yoga teacher) telling them how to move their body might trigger a stress response. Making everything optional returns power to the student. Am I qualified to help people who have PTSD? Over the weekend, I wobble back and forth mentally about whether I have what it takes to volunteer. As a white woman who can’t actually touch my heels to the floor in downward dog, I’ve often worried that students in a typical class will judge me unqualified – either because I’m not Indian or because I can’t do advanced poses. But trauma-informed yoga doesn’t present any shape as more or less correct. The only goals are to breathe more deeply, notice sensations, and feel a positive connection to your body. I can do that! I haven’t had to spend time on the streets or in prison. But as someone with mental health challenges, I can testify that yoga made me feel better on intolerable days. Or that it gives me a sense of control in situations when I have none, for example, giving birth. So maybe I could do this. Nicole reminds us that we aren’t set loose to volunteer after these 18 hours. She or another trainer will accompany us to our first classes until we feel comfortable going alone. Yoga Outreach mentors volunteers intensely because once they get the hang of it, they’re likely to carry on for years. Volunteers get so much payback in gratitude from the students and from the staff at facilities, she adds. Some volunteers like that they’re fulfilling a need to give back, while others focus on how much they learn from teaching in a different style in locations they might never otherwise visit. 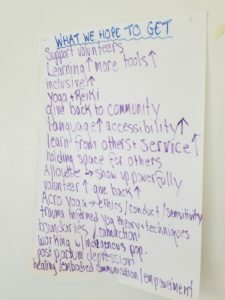 Yoga Outreach volunteers get so much back in terms of resources, mentorship and, of course, fulfillment. On Sunday, several current Yoga Outreach volunteers speak to us in small groups about what it’s like to lead yoga classes in detention and recovery centres. Often nobody is doing what we might consider yoga, they say. Instead the students are sleeping, shivering under blankets or leaving for smoke breaks. Sometimes the students look forward to the weekly break in routine. Other times they are sullen or hostile. One volunteer shared how a female student sneered every time she arrived for a year. One day the same student told her that yoga class was her favourite time of the week and what she’d miss most about leaving the facility. It’s a reminder that we can’t ever be sure about another person’s experience, even when they’re right in front of us. Another volunteer talked about the challenges of setting boundaries. I was all ears because that’s one I have trouble with too. Her students, incarcerated youth, were always asking questions about her life. Does she like to party? Why does she like hanging out in prisons instead of with her boyfriend? Prison staff and Yoga Outreach trainers coached her through this difference between professional and personal interactions. Keeping trauma survivors at a professional distance isn’t cruel, Nicole explained. It safeguards them from feeling rejected when the teacher inevitably sets a limit on interactions. Better to establish ground rules early on than disappoint. Trauma sensitivity is important for regular classes, as well as prisons, recovery centres or transition houses. Most of us are coping with something that makes us feel nervous, unsure or defensive at times. 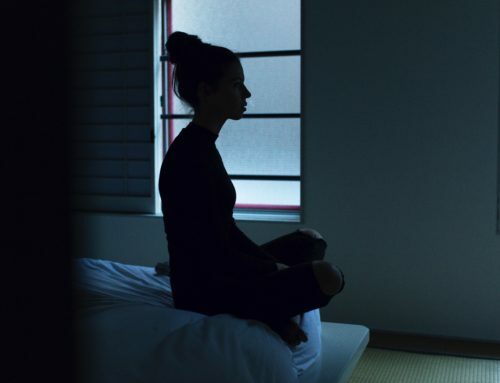 Why trauma lodges itself in the body as much as the mind. Why trauma is resistant to healing with traditional therapy. How yoga can help people cope with physical symptoms like panic attacks. Why a trauma-informed yoga class can look nothing like a regular class. 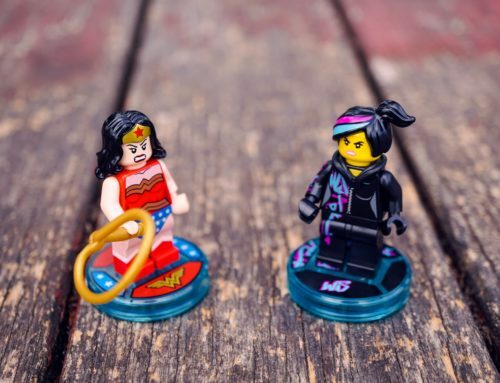 How to integrate trauma-informed techniques into your regular classes. Whether or not you end up volunteering, understanding trauma will change the way you plan your regular yoga classes. Honestly, most of us are dealing with some amount of trauma or fear of losing control even though it hasn’t received a label like PTSD. 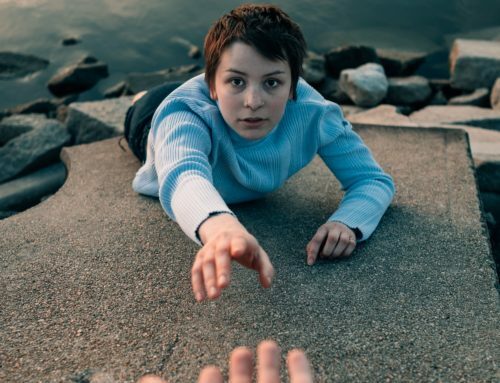 Some of your students are likely already trauma survivors – they’re just not going to reveal it at the yoga studio. 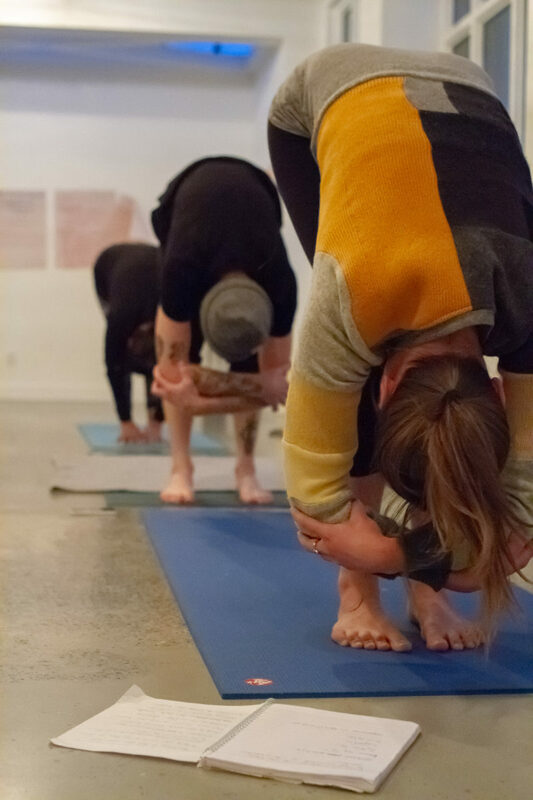 I promise that once you have taken the Yoga Outreach Core Training™, you will think twice before pulling on someone’s hips to help them back into Downward Dog. You’ll probably also think twice about taking it personally when someone doesn’t follow your perfectly crafted sequence. For me, I think back to the first time I used yoga to stop an endless loop of shame and blame in my head. My social circle had disintegrated and I was living overseas. My mind wouldn’t stop repeating and rewriting last conversations. But when I went to a yoga class, promising myself I’d focus for an hour, my mind rested. It was like setting down a heavy weight and turning off blaring music. What if everyone with a loopy, heavy, blaring mind could use yoga to rest for one hour?